Here are some of the specific headline risks that have sparked market volatility, along with a review of economic projections for 2019. The Federal Reserve has been gradually lifting the federal funds rate (now in a range from 2.25% to 2.5%) and slowly reducing its balance sheet.10 These policies are intended to reduce liquidity in the economy and help control inflation, but higher interest rates are also a headwind for stocks, because they help less-risky assets such as bonds attract more capital. It’s normal for the Fed to tighten financial conditions and remove support for the economy as it strengthens. Rates were increased four times in 2018, and the committee’s most recent estimate is for two more rate hikes in 2019 rather than three.11 Still, there is some concern that interest rates will rise more rapidly than the economy can tolerate, putting the brakes on growth. Unresolved geopolitical issues (including a prolonged government shutdown) or disappointing economic reports could continue to upset the stock market in the coming months. Even so, if you panic and flee the market during a downturn, you won’t be in a position to take advantage of growth on an upswing. And if you are investing for a long-term goal such as retirement, a down market may be an opportunity to buy more shares at lower prices. 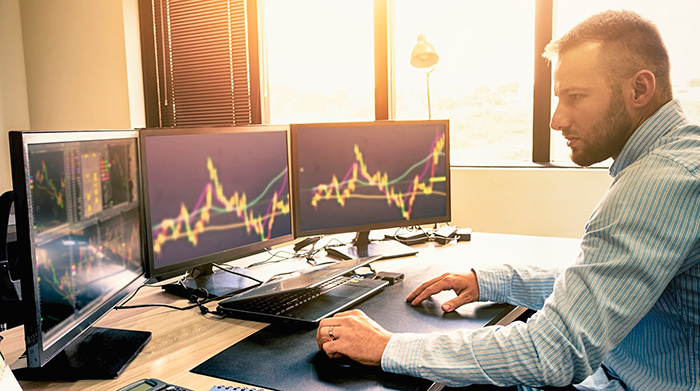 Though it can be difficult to take the headlines in stride and control your emotions, sticking to a sound investment strategy is often the best course of action. The return and principal value of stocks and bonds fluctuate with changes in market conditions. Shares, when sold, and bonds redeemed prior to maturity may be worth more or less than their original cost. U.S. Treasury securities are guaranteed by the federal government as to the timely payment of principal and interest. The S&P 500 is an unmanaged group of securities that is considered representative of the U.S. stock market in general. The performance of an unmanaged index is not indicative of the performance of any specific investment. Individuals cannot invest directly in an index. Past performance is not a guarantee of future results. Actual results will vary. Mary Dill is licensed in OR & WA to offer insurance products, and life insurance (including variable life), annuities (including variable annuities), and is securities registered in CA, CO, FL, ID, NV, NY, NC, OR, SC, TX and WA and advisor registered in OR and TX. Kyle Sullivan is licensed in ID, OR & WA to offer insurance products, and life insurance (including variable life), annuities (including variable annuities), and is securities registered in CA, FL, ID, MT, OR, TX and WA and advisor registered in OR. Rich Dixon is licensed in OR & WA to offer insurance products, and life insurance (including variable life), annuities (including variable annuities), and is securities registered in OR and WA. Kathy Kusudo is securities registered in OR & WA. IMPORTANT CONSUMER INFORMATION: Mary Dill, Kyle Sullivan and Rich Dixon may only transact business in a particular state after licensure or satisfying qualifications requirements of that state, or only if they are excluded or exempted from the state's registration requirements. Follow-up, individualized responses to consumers in a particular state by Mary, Kyle and Rich that involve either the effecting or attempting to effect transactions in securities or the rendering of personalized investment advice for compensation, as the case may be, shall not be made without first complying with the state's requirements, or pursuant to an applicable state exemption or exclusion. For information concerning the licensure status or disciplinary history of a broker-dealer, investment adviser, BD agent or IA representative or any financial institution they represents, contact your state securities law administrator. Insurance products issued by Principal National Life Insurance Company (except in New York), Principal Life Insurance Company, and the companies available through the Preferred Product Network, Inc. Securities and advisory products offered through Principal Securities, Inc. , 800/247-1737, member SIPC. Principal National, Principal Life, the Preferred Product Network and Principal Securities are members of Principal Financial Group, Des Moines, IA 50392. Mary Dill and Kyle Sullivan, Principal National and Principal Life Financial Representatives, Principal Securities Registered Representativse, Financial Advisors. Richard Dixon, Principal National and Principal Life Financial Representative and Principal Securities Registered Representative. Kathy Kusudo, Principal Securities Registered Representative. Tribe Financial Group is not an affiliate of any company of the Principal Financial Group.